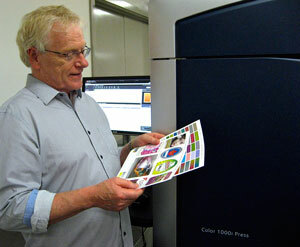 West Chester, Ohio, USA; February 2016—Intertype based in Australia, has become the first certified Color-Logic printer in the world for the Xerox Color 1000i Press using the Xerox®EX-P 1000i printer server powered by Fiery®. Commenting on the development, Color-Logic Director of Sales and Marketing, Mark Geeves said: “In my first conversation with Ian Bosler, CEO of Intertype, I could tell that Intertype represented the future face of the printing industry by demonstrating what is truly possible with digital. Unlike many printers who are just moving their offset jobs onto digital press platforms, Ian truly understood the value of Xerox Dry Silver Toner combined with Color-Logic’s software, and how it can open up new business opportunities for not only Intertype, but their clients too. In Ian’s own words “standing out and getting noticed is fundamental to creating high performing marketing and sales communications”. “The world today is about differentiation and we look forward in seeing the results Intertype brings to their clients” said Geeves.